The UEFA Champions League Round of 16 will continue with the second day of the first leg ties. One of the two matches on show on Wednesday will see defending champions Real Madrid lock horns with Ajax at the Johan Cruijff Arena, looking to get one step closer towards winning the competition for the fourth successive year. 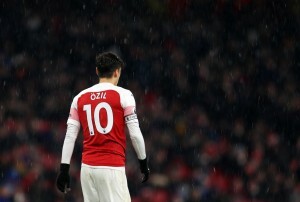 Ajax reached the Last 16 stage after narrowly finishing as the runners-up in Group E, finishing a mere two points behind group winners Bayern Munich. In domestic football, it has been a similar theme for de Godenzonen, who are being PSV Eindhoven on the Eredivisie table, with their form suffering recently – Erik ten Hag’s men have failed to win three of their last five matches. Real Madrid, on the other hand, qualified for the knockout rounds by clinching Group G ahead of AS Roma. Heading into the match against Ajax, the UEFA Champions League holders have been on their best run of form so far this season, with the 3-1 win over Atletico Madrid stretching their unbeaten run to seven games. Real Madrid cruised to a 4-1 win on their last visit to Ajax, back in October 2012, and have recorded as many as 11 goals on their trip to Amsterdam in the past. Ahead of the latest meeting between the two sides, The Hard Tackle takes a closer look at the encounter. Erik ten Hag does not have many pressing concerns hampering his preparations ahead of the visit of Real Madrid. On Wednesday, the Ajax boss might only be without two first-team players, with Hassane Bande (ankle) a certain absentee, while Lisandro Magallan (leg) is a doubt. 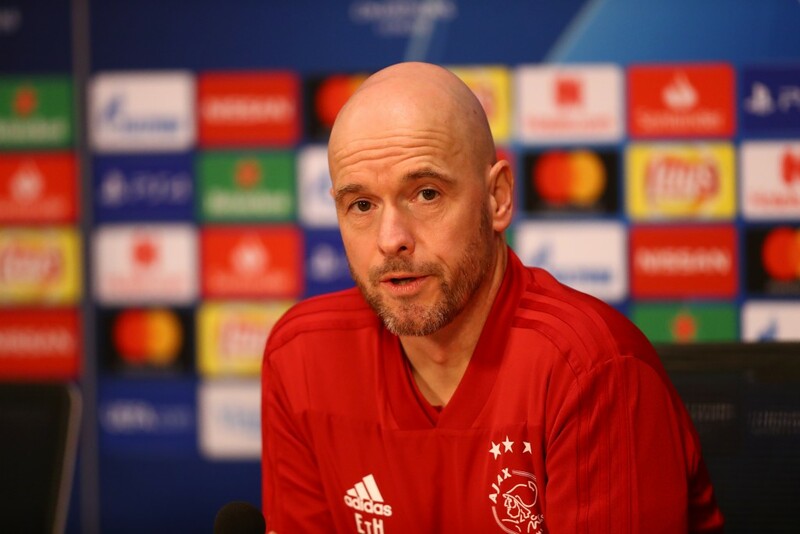 Heading into the Champions League tie, ten Hag had been sweating over the fitness of key duo Frenkie de Jong and Nicolas Tagliafico, who were both struggling with niggles. But, both players have shrugged off their minor complaints to make themselves available for Wednesday’s fixture. Tagliafico should thus, be the left-back for the hosts, while de Jong will be the deepest lying midfielder in a three-man axis. The Argentine full-back, in particular, will be important in driving Ajax forward from the left flank, with de Jong pulling the strings in the middle of the park. Another key man at the back will be Matthijs de Ligt, who will have the daunting, but achievable task of stopping Real Madrid’s in-form striker Karim Benzema. Daley Blind and Noussair Mazraoui will likely complete the back four that should provide cover to Cameroonian shot stopper Andre Onana. In midfield, de Jong will be joined by Donny van de Beek and Lasse Schone, with the former looking to drive Ajax forward through the central areas and the former contributing more on the defensive side of the game. Up ahead in attack, a lot of the onus will be on top scorer and ever-present Serb Dusan Tadic. Kasper Dolberg should get the nod ahead of former Real Madrid striker Klaas-Jan Huntelaar to lead the line for the hosts on Wednesday, with Hakim Ziyech shouldering the creative burden on the right side of the attack. Santiago Solari has taken the trip to the Dutch capital without four first-team players, although only one of them is a regular under him. Luca Zidane (calf), Jesus Vallejo (thigh), Isco (back) and Marcos Llorente (groin) are all unavailable to take on Ajax. While Llorente’s absence due to another injury is a concern, Casemiro’s fine recent form means Solari is unlikely to fret the unavailability of the young Spaniard all that much. As far as the other three players are concerned, they are only bit-part players under the current Real Madrid boss. Most of Solari’s team selection seems to be straightforward, with Thibaut Courtois being the first-choice goalkeeper for Real. Ahead of him, Dani Carvajal, Sergio Ramos, Raphael Varane and Sergio Reguilon comprise the four-man defensive line of choice, with Reguilon usurping Marcelo in recent weeks. Up ahead in midfield, the dominant trio of Luka Modric, Casemiro and Toni Kroos have slowly but surely found their way back to top form, and their performance will hold the key for the visitors against Ajax. Meanwhile, two of the three attackers are automatic selections as well. Vinicius Jr. and Karim Benzema have been the form players for Real Madrid during their resurgent run, and there is no looking past the duo for two of the three attacking spots. The final place in the side is a toss-up between Gareth Bale and Lucas Vazquez, with the Welshman likely to get the nod after an impressive cameo against Atletico Madrid. 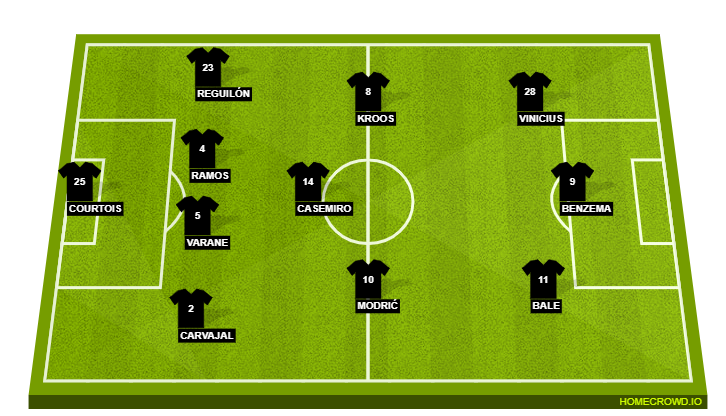 Probable Lineup (4-3-3): Courtois; Carvajal, Varane, Ramos, Reguilon; Modric, Casemiro, Kroos; Bale, Benzema, Vinicius Jr.
Real Madrid and Ajax have met 12 times in European competitions, with the visitors holding the edge in the head-to-head record (W7 D1 L4). Los Blancos’ most recent record against their hosts is even more impressive, with the Champions League holders triumphing in each of the last six meetings. Ajax are in the Round of 16 for the first time since 2006, but have never won at this stage of the UEFA Champions League. In fact, the Dutch club are without a win in their last six UEFA Champions League knockout fixtures (D2 L4). Real Madrid, on the other hand, have appeared in the UEFA Champions League Round of 16 every year since its introduction in 2003-04. Real Madrid have won each of their last nine two-legged knockout ties in the competition, since being beaten by Juventus in the 2014-15 semi-finals. Ajax have not won any of their last five home UEFA Champions League knockout matches (D3 L2), with their last success coming against Borussia Dortmund (1-0) in the 1995-96 quarter-final second leg. That Frenkie de Jong is destined for big things has already been all too well known. But, with a big move to Barcelona sealed, the Dutch midfield prodigy is set to have a bigger platform to showcase his talent. All that though, will only be happening next season. Before that, however, the UEFA Champions League presents a big enough platform to do the same. 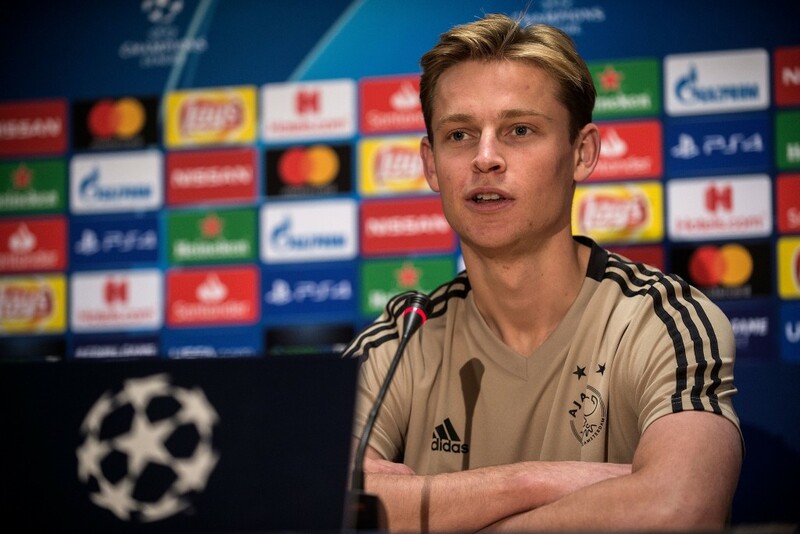 With future rivals Real Madrid set to visit on Wednesday, de Jong can go about winning fans at his future club already with a game-changing performance. The biggest game of his life beckons for young Frenkie de Jong, with the Champions League tie set to provide a glimpse of what he is all about, on the big stage. Their group stage campaign showed that Ajax are no pushovers, having held the mighty Bayern Munich to two draws. And so, Real Madrid cannot afford to take their hosts lightly when the two sides meet in Amsterdam on Wednesday. What is certain though, is that the game should have plenty of goals in it, just like the last time they faced off against each other, with both sides being quite prolific. As far as the result of the first leg tie goes, recent form should provide a good picture as to what to expect. Ajax’s form has tumbled, while there has been very little stopping Real Madrid lately. Expect both sides to find the back of the net, but The Hard Tackle predicts a rather straightforward 3-1 win for Santiago Solari’s men, which should put them in a strong position to qualify for the quarter-finals.